Democrats are misbehaving – so Donald just dropped the Washington hammer on all of them. Democrats have been playing dirty. Pelosi uninvited Trump from his own State of the Union, and they rejected Trump’s fair deal before America even heard it from Trump’s mouth. They think they can get away with anything. But Trump is giving them a taste of their own medicine. “Under no circumstances during a government shutdown will any government owned, rented, leased or chartered aircraft support any Congressional delegation, without the express written approval of the White House Chief of Staff,” wrote Russell Vought, acting director of the Office of Management and Budget. 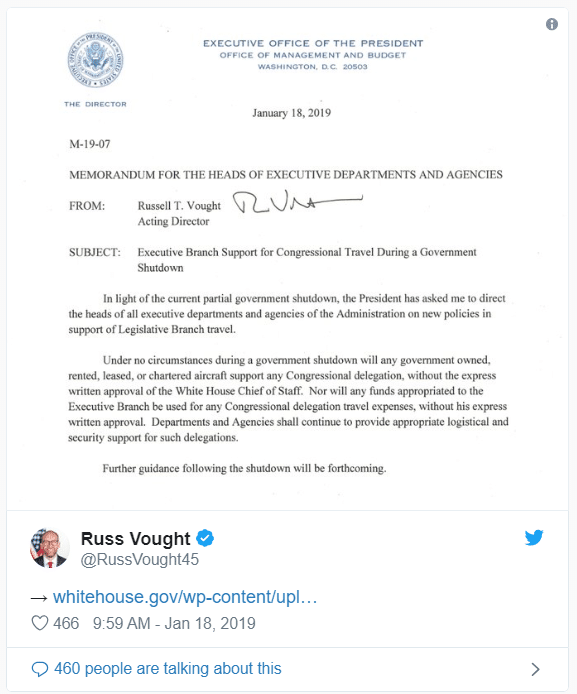 “Nor will any funds appropriated to the Executive Branch be used for any Congressional delegation travel expenses, without his express written approval,” Vought’s memo said. SHARE if you support President Trump coming down hard on Democrats! Just days ago, President Trump pulled the rug out from Nancy Pelosi just minutes before her military plane was scheduled to leave for a week-long trip during the shutdown. But now, Donald is letting know this isn’t a personal feud with Pelosi. This is about the entire Democrat party sitting on the sidelines, refusing to try to make a deal. They will not be allowed to fly anywhere on military planes until the shutdown is over. This is what they get for partying in the Carribean while Trump tries to work to end the shutdown. Already bills are in the works to take away pay for Congress, and even force them to stay in the Washington swamp until the shutdown ends. SHARE if you support President Trump keeping Democrats grounded for their shutdown!